*Does not apply to homebuilder pools. Price does not include tax. With 20 years of building experience, Caribbean Pools has watched pool companies come and go. When you’re ready to build your dream pool, it’s important to choose a company that will be here tomorrow. We utilize only the highest quality parts and equipment and employ only licensed and bonded professionals, giving you the security that your pool will be built right the first time. No two Caribbean Pools are the same. Each is uniquely designed by an experienced draftsman and custom tailored to fit your home’s personality. We strive to offer our customers the best deals possible on all swimming pool construction & other pool projects! Whether your dream is a new swimming pool construction for those hot summer days or you envision tropical waterfalls and a relaxing spa to unwind in, Caribbean Pools can help you achieve your vision. We make having a vacation in your own backyard affordable.Caribbean Pools has been designing and building swimming pools, spas, and waterfalls in AZ for 20 years, building a name for quality products, friendly customer service, and competitive pricing. When you contact us for your new pool construction or pool renovation needs, you can expect expert service, along with the most experienced technicians in the pool construction field, to be with you every step of the way from your free in-home assessment all the way through to the completion of your project. 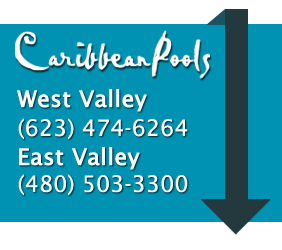 Don’t forget to Like Caribbean Pools AZ on Facebook and let us know if you have any questions regarding Swimming Pool Construction or Swimming Pool Renovation special offers in the East or West Valley.